My unit on migration was due for an upgrade this year. First, I had planned to add an ArtSmart unit that I had developed with TPAC Education, which would bring a teaching artist into my classroom--more on that in another blog--and lead to a field trip to see the Cuban fusion group Tiempo Libre perform. Second, my country had changed a lot since the last time I had taught the unit. It was time for new perspectives on the issue, beginning with the new President of the United States of America. an emphasis on the use of source text to support writing and discussion about the texts (Reading 1). I teach in a very conservative community, so I took a lot of pride in presenting a range of opinions on immigration. The 2016 Election proved a lot of things about my country--that "Golden Door" for migrants and refugees. 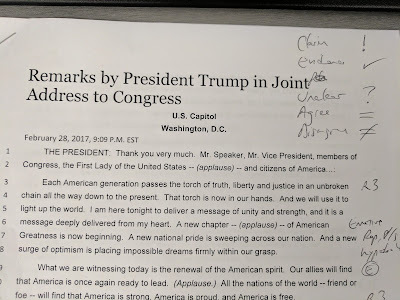 Among the things I learned were that Jeb Bush was probably too liberal on immigration, and that the DREAM Act needed more lowercase "dream" than uppercase HOPE. The standards said, though, it was time for argumentative writing, which meant that I would go from teaching Jeb Bush to Donald J. Trump. I needed a source about migration, so I chose the speech, which was barely a week old at the time I assigned it. I edited it to focus on migration and preserve the President's opening and closing remarks. This brought the length down to four printed pages--about 10 minutes' reading--which I have found is a good length for in-class reads. On our first reading, students were directed to annotate the text. I let students create their own code or emojis, while requiring they look for specific details. You can see my symbols on the top, right of the page. On the first reading, I always ask students to find main ideas (Reading Informational Text standard 1) and identify the evidence the writer uses to support the idea (RIT standard 2). You may notice that I used the word, "claim," for main idea, because this was an argumentative text presented to encourage an argumentative performance (Writing standard 1). In the discussion, I focused in on Trump's use of evidence. What was his strongest evidence? What evidence was poorly supported? For a year now, every time the word, "Trump," came up in class, it has seemed like students quit thinking and start stating emotions or "I think" phrases. As we went into the discussion, I could tell there were strong feelings. As I have written, my community is very conservative. I would estimate that about 40% of my students voiced support for President Trump, about 20% seemed against him. The remaining 40% didn't have strong opinions either way. As we debated Trump's speech, however, a remarkable thing happened. Students were expected to base their opinions on Trump's words. We had all read the same text, and it was a common experience. While I had hear strong opinions--along with illogical ones--voiced prior to the Election, students addressed the facts with insight and respect. Whenever someone went off course, I would ask, "What does Trump say about this?" This prompt directed students back to the text. Following the debate, I assigned a paragraph: "What do you feel is President Trump's strongest claim in the speech?" Students were expected to support their answers with text and analysis. Today I asked students to look at the evidence used in the speech. I only had fifteen minutes or so, so I asked them to prove or disprove three of the facts Trump used, along with mentioning the source they had used. I have a "canned lesson" on Rhetorical devices in my Google Drive, and I thought this would be a great chance to reinforce these tools with students. I went over the common terms with students. 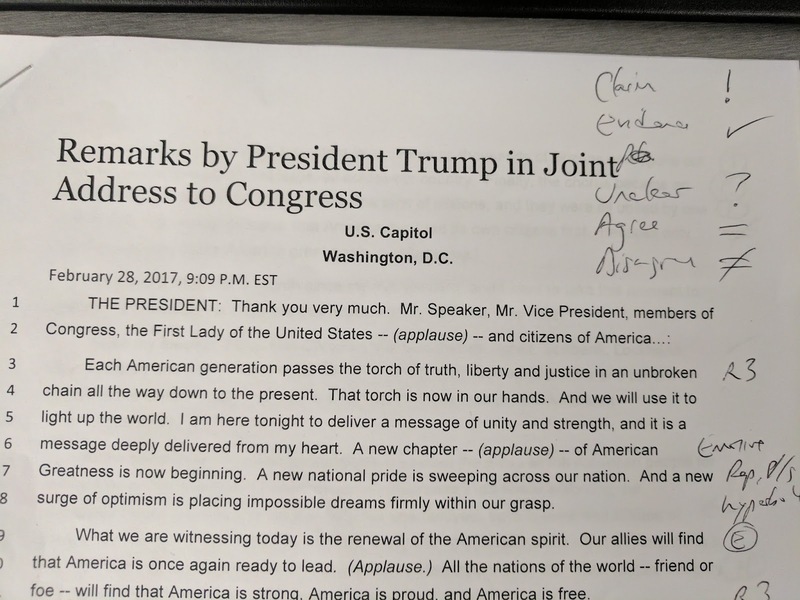 Despite the fact that the lesson had been developed years ago, I had always used remarks from President Obama's inaugural addresses to help students practice identifying the rhetorical devices. 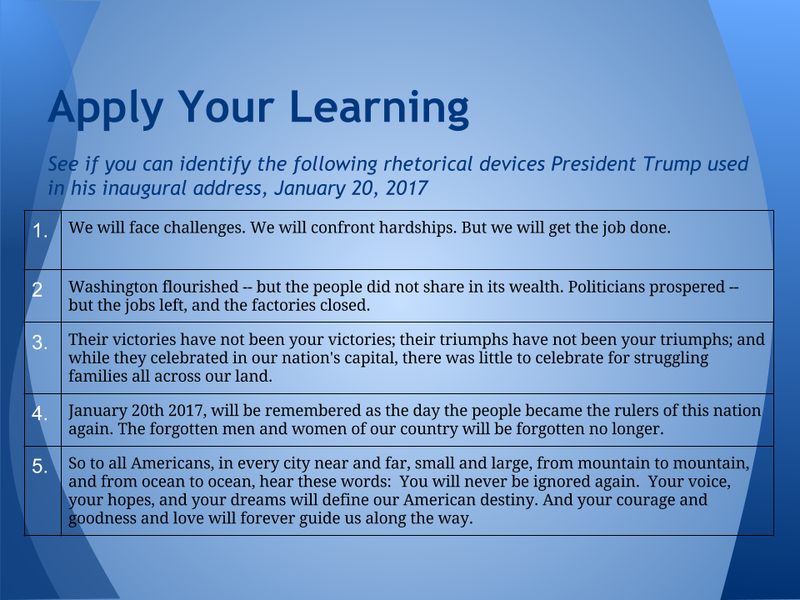 I updated the lesson using Trump's own inaugural address. After going over the rhetorical devices, I put this slide on the board and had students figure out which rhetorical devices Trump had used. I had to be away this day for a meeting at my district's office. I left behind a worksheet that reinforced the the rhetorical devices. Students had already looked at the speech twice. This time, they would identify specific quotes and connect them to the rhetorical devices I had taught in class. A week later we returned to the speech as one source for our debate. Students were directed to use the text to support their remarks, and I encouraged them to scout out counterclaims, which might be used. One of the fascinating elements of the debate had to do with a fact from the Pro side, which the Con side failed to prepare for: it was Trump's claim that illegal immigrants cost the United States $113 billion every year. I had invited a vice principal to visit the class as a "judge," and he cited this undisputed fact as his reason for siding with the Pro side. 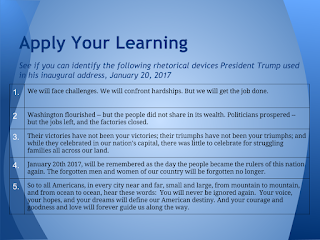 What happened when I taught Trump? Learning happened. What's more, Common Core helped a lot with this. Over three readings of the speech, I was able to address five Reading Informational Text standards (1, 2, 3, 6, 7), six Writing standards (1A, 1B, 1D, 1E, 7 and 8), and eight Speaking & Listening standards (1A, 1B, 1C, 1D, 2, 3, 4, and 6). Garrett had argued passionately for Pro in the "great wall" debate. He had certainly elected to also drive down to Nashville and show his support for Trump. I was pleased that Trump's people elected to feature him directly behind the podium. Perhaps one day I'll see Garrett speaking at a podium as a leader in his own right.